Manaslu Trekking is a well-loved, adventurous and challenging trek that offers you beautiful mountain views, combination of rich culture heritage with unparalleled beauty and biological diversity. Standing 8156m tall Mt. Manaslu is eighth highest peak of the world. The name Manaslu means “The Spirit Mountain” in the local language. The walking trail follows an ancient salt-trading route of Tibet. Previously closed this area was opened is 1991, but took several years for the word to get out. Manaslu trek begins from Arughat. We pass through Soti khola, Machha khola village, Jagat, Deng, Namrugn, Samagaon, Samda, Larkya La pas(5160m) and descend to Bimthang, Tilije, Syange and back to Kathmandu. Larkya La Pass is the highest point of the journey which provides outstanding views of Himchuli, Manaslu, Himlung Himal, Cheo, Kangguru and Annapurna II along with Larkya Glaciers. The trekking trail takes us through narrow steep path, Budhi Gandaki valley, tropical waterfalls, few rice terraces, suspension bridges, thick forests of rhododendron and Himalayan blue pine, glaciers and many more. 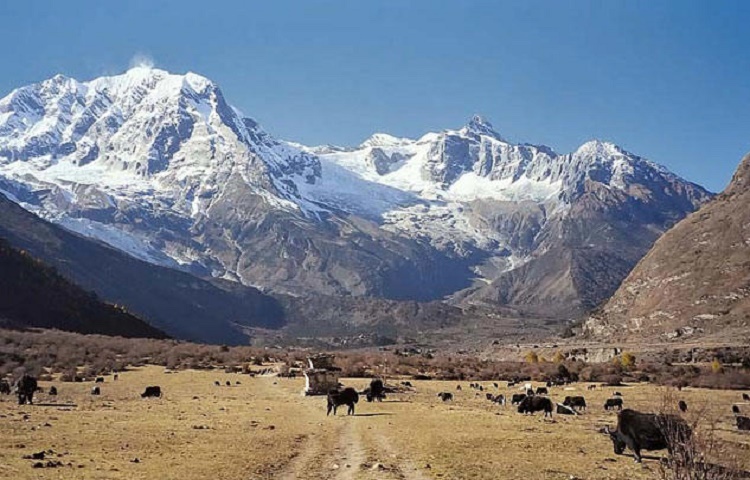 Samdo village is the highest village in the Budhi Gandaki valley inhabited by Bhotias, offers spectacular view of the valley and Pang Phuchi village with a backdrop of Tibetan border. We also come across some Gurung villages in the beginning. We can occasionally see wild animals and birds as Manaslu region is blessed with 110 species of bird’s including Golden Eagel, Eurasian Griffon, Kalij, Lophophorus(national bird of Nepal) and many others. This region has 19 different types of forest. We set off early today for Sotikhola. During the drive, we enjoy views of the Nepalese countryside along with the mountain sceneries. We will be driving on a paved road from Kathmandu to Dhading Bensi, district headquarter of Dhading (1050m)but the drive from Dhanding Bensi to Arughat will be on a rough road. Upon reaching Arughat, a major town in the region we drive further towards Sotikhola. Overnight in Soti Khola. At the crossing of the bridge, we trek through the beautiful Sal forests, then climb onto a ridge above huge rapids on the Budhi Gandaki. We then reach Khursane upon which the rocky trail weaves its way up and down, past two tropical waterfalls on a steep, rocky trail clinging to the side of a cliff. It eventually makes its way down and past a few rice terraces, then up and around to the Gurung village of Labubesi. We further climb behind a rocky outcrop, where the valley opens up and the Budhi Gandaki meanders among wide gravel bars. Dropping to the sandy river bed, we walk along rounded stones before climbing over a side ridge. We head down again to the river and cross another suspension bridge to reach Machha Khola village. Overnight in Machha Khola. The narrow trail makes some minor ups and downs and eventually crosses the Tharo Khola and reaching Khorlabesi. After a few more ascends and descends we come across a small Hotspring in Tatopani. From the hot spring, we climb over another ridge, then cross the Budhi Gandaki on a suspension bridge. At this juncture, we climb on a wide, well-crafted staircase, then across a landslide and over a ridge to Dobhan. Upon crossing a suspension bridge over the Yaru Khola, we climb the stone stairs and then drop to the river and again climb more stone stairs to Tharo Bharyang. Crossing the west bank of the Budhi Gandaki, we climb over a ridge, trek along the river and then climb towards the village of Jagat. Overnight in Jagat. We begin today’s trek by climbing over a rocky ridge to Salleri, and then descend to Sirdibas. The valley widens a bit as the trail continues up to Ghatta Khola. We further continue walking upstream to a long suspension bridge in Philim, a large Gurung village. The trail turns north just above the lowest house in the village and stays on a fairly level trail as it crosses millet fields to Ekle Bhatti. The route now enters a steep, uninhabited gorge. At this point, we descend to the grassy land slopes, cross the Budhi Gandaki, then trek along the west bank for a while, then cross to the east bank and then back again. As we continue through the trail the valley widens and we pass through bamboo forests to the Deng Khola. Upon crossing the Khola, we reach the tiny village of Deng. Overnight in Deng. After a brief walk beyond Deng, we cross the Budhi Gandaki and climb to Rana at 1910m. From the bridge, we climb a bit to join a trail from Bhi, then head west up the Budhi Gandaki valley. The trail also passes through forests and mani where we turn towards a corner that contours to Ghap. Even though there is another route, we take the route through Prok village. Prok village has a viewpoint for a beautiful sight of Siringi Himal. We further cross the Budi Gandaki several times today and come across several gompas en route. The trail follows the river upstream through a dense forest. After crossing the river at an impressive spot where it thunders down a narrow gorge, the forest becomes less dense and the trail is fine again. The pleasant walk continues and after a last steep climb we reach Namrung. Overnight in Namrung. Namrung village is a good viewpoint for Siring and Ganesh Himal and from the village one can also see Mt. Himal Chuli in the south. We climb steadily and pass through forests and reach Lihi, a fine village with many chortens and barley terraces. The trail drops and crosses the side valley of Simnang Himal with Ganesh Himal always close by. We further pass through Sho, Lho and Shyala villages before reaching Sama Village. We enjoy extraordianary views of Mt. Manasly from Lho village and also explore the famous Ribung Gompa. In Shyala village we will be surrounded by high mountains like Himal Chuli and Peak 29 (Ngadi Chuli) to the left, Manaslu and large glaciers straight ahead, and other snow summits to the right, and at the far end stands Ganesh Himal. Today’s journey ends in Samagaon where we spend the night. We spend the day at Samagaon both for rest and acclimatization. Today, we get acquainted with the rich Sherpa culture. We enjoy the sight of thousands of mani stones with Buddhist texts and pictures and the Sherpa women clad in traditional clothes and ornaments. On a little hill near the Sama village is an old Gompa (Pungyen Gompa), a monastery with great views of the glacier. It is named after Manaslu, Pungyen means bracelet, a good description of the two peaks. It was destroyed a year after the first unsuccessful Japanese attempt to climb Manaslu. The locals believed that the climb angered the gods, and when the Japanese came back a year later they met with a lot of resistance that they had to give up their attempt. They were finally successful in 1959. Overnight in Samagaon. Today, we descend to the Budhi Gandaki River, that has turned north and follow it to a bridge over a side stream. The trail to the left leads to the Manaslu Base camp. The Larkya la Trail passes several mani walls as the valley begins to widen. It is an easy trail on a shelf above the river passing the juniper and birch forests of Kermo Kharka. We drop off the shelf, cross the Budhi Gandaki on a wooden bridge and climb steeply onto a promontory between two forks of the river. From a stone arch we can view a large white kani. Finally passing through the kani we find Samdo. Overnight in Samdo. 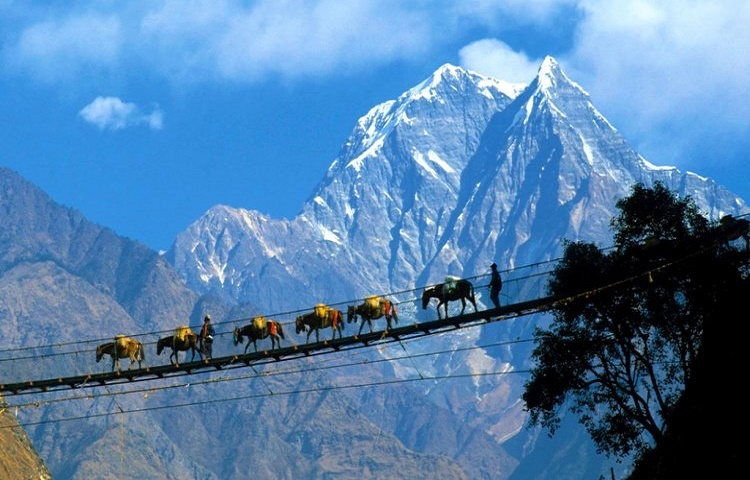 Even today, we continue our walk down the edge, cross the wooden bridge over Budi Gandaki and begin walking upward. Upon crossing two streams and witnessing the Larkya Glacier we go around the valley of the Salka Khola and climb up again to the stone guest house (4450 m), which is not a lodge but a kind of shelter called Dharmshala, also known as Larke Phedi. The short walk today also leaves plenty of time for acclimatization and relaxing in the afternoon. Overnight in Dharmashala. After a short climb, we reach a valley on the north side of the Larkya Glaciers from where we can enjoy great views of Cho Danda and Larkya Peak. Finally, we walk across moraines of the glacier, making a gradual ascent which becomes steeper only in the last section of the pass. From the pass, there are outstanding views of Himlung Himal, Cheo Himal, Kangguru and the huge Annapurna II. It is a longer day than usual to Bimtang, but to walk into these low pastures with the evening mist coming in with Mt. Manaslu looming close by is an overwhelming experience. Overnight in Bimthang. From a ridge at Bimthang, we can enjoy great views of Mt. Manaslu, Lamjung Himal, Himlung Himal and Cheo Himal. We descend further and cross a high pasture (Sangure Kharka) followed by a bridge over Dudh Khola. We walk through rhododendron forest and follow a trail through a narrow valley until we reach the highest cultivated land of the valley at Karche, 2785 meters. We pass across fields before making a steep climb over a ridge. The trail comes off the ridge in a big, sweeping arc to the river bank at 2580m. A short distance beyond is the village of Gho. Due to yesterday's tiredness we might take an overnight rest at Gho but better lodges are available at Tilije, so Himalayan Glacier recommends we stay at Tilije. Overnight in Tilije Village. We climb over a small ridge and enjoy the stone paved trail as it passes through a beautiful village. We then cross the bridge over Dudh Khola and climb up through a chorten-shaped arch, pass a mani wall and reach the Thonje village. At the village, we go through a police checkpoint and continue to Dharapani. We have entered the Annapurna circuit section from Dharapani. Further down, we come across Karte village and after quite a bit of walking we cross a bridge over Marshyangdi Khola. We also come across some mani walls before reaching the village of Tal, situated at the foot of a large waterfall. Overnight in Tal. We follow the trail to Chyamje village crossing the Marshyangdi Khola once again. The Marsyandi valley opens with its terrace fields and villages clung very high to the hillsides. The trail then descends through rhododendron and and pine forests to Syange. Overnight in Syange. The drive from Syange to Kathmandu via Besi Sahar offers one an opportunity to enjoy both hill and mountain landscapes. The drive is often along the banks of the Marsyangdi and Trishuli rivers. We also drive by some beautiful villages with farming terraces on both sides of the road. In Kathmandu, we will be escorted to our hotel. The day in Kathmandu can either be spent in leisure or perhaps we catch up with some last minute shopping. Onto the successful completion of journey we give a farewell dinner to all of the group members.Overnight at Hotel.